Oh noes, not another family history blog! Probably what makes this different to other genealogy blogs out there is not its focus on one person's family history (I'm sure there are plenty of those) but the age of yours truly, the author. I am the only genealogist I know personally who is under 45. Consequently not only will you see the normal ponderings on people, places, events, brick walls, local heritage and research, but also memes, pop culture references and the odd expletive. We all know that one of the things people say about the generation immediately below them, apart from the fact they don't appreciate good music (I'm looking at you here Gen Y!) is that they can't wait for anything and have to have instant gratification. Sadly, I'm forced to concede this is slightly true. If I can order a certificate and see an image right now it's definitely going to have that bit more appeal than having to wait for it to arrive in the mail, so combine that with a price drop and I am pretty much guaranteed to be relieved of some cash before you can say "Instant donwload anyone?" 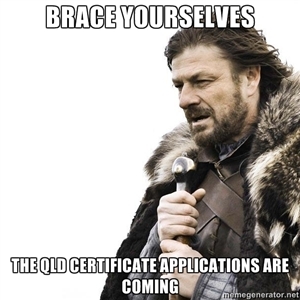 Consequently my credit card had a good cry when the fine people at Gould Genealogy posted the information that the Queensland BDM has moved to online ordering with some certificates available as digital images, AND cut their prices to boot, leaving me with nothing to complain about except the slight lag in downloading speed. You bastards. Related? Love to hear from you! As will become apparent from my blog, I am the Gen X genetic product of a selection of people who emigrated to Australia between 1839 and 1888. My favourite way to relax is trying to find out as much as I can about each and every one of those people and their near relations. Of course mostly they turn out to be smart, funny, intelligent... Er... well, perhaps not mostly... Warning: this Blog contains language which may offend those who are offended by that kind of thing. You can blame the sailors in my family.